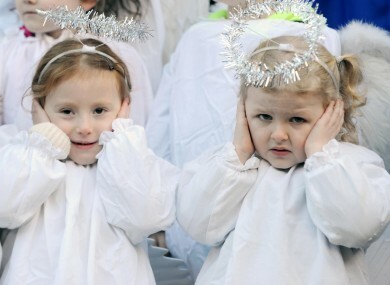 Children dressed as angels on the steps of the Mansion House at the opening of the annual Irish Farmers Association live crib earlier this week. The news over the past seven days has been a mixture of the very serious – including the tragic death of Shannon Gallagher in Donegal, Labour TD Colm Keaveney being expelled from the parliamentary party after voting against the Social Welfare Bill and a motion of no-confidence in the Government – to the not so serious, including this attack on Santa in Temple Bar and this rather unexpected note in the RTE Guide’s tv listings for Christmas Day. Usual process: I get tree out of attic and erect it while spreading branches. Check lights work, yes. Stick them to tree (feel all warm and Christmassy, love life and the mot. Might even have a beer). Take out the coloured things and put them on nearest branches, great, it’s gonna be a wonderful time of year. The mot comes in to see my display and proud face on me, wait for hug and Mr. Crosby song to come on. “I’ll do it myself”, and reminds me of how useful I would be if there was more distance between us. Call her a particular farm animal, she slags my family off, I go to boozer and talk to the pint puller about the budget. It’s tradition! People get so caught up in buying presents and partying. They forget what its all about! the birth of santa claus. A couple of nice Cohiba cigars, a half dozen Hoegaarden beers, (the reason Belguim exists) a bottle of Louis Roderer and a smile coupled with a look of contentment upon wife and daughters faces. Craig Doyle must have been Googling himself like a mad! With UPC fibre powered broadband, he could do it more efficiently, that is all. It’s the independent labels I feel sorry for, I read an excellent article about the head of one who said how vital HMV are to their business, HMV buy the records outright from them whereas many of the Independent stores will only buy on a sale and return. The death of records stores will be a sad day, so much life and soul and expertise will disappear, I’d take the word of 99% of employees of good record stores over crap like genius’ suggestions. I have never commented on the Journal before although i read it daily. Never felt the need to really. But this story is just the most tragic story that brings tears to my eyes literally. I am a father of two young daughters. Words escape me to describe how this makes me feel. That poor poor family. I hope never to feel the need to comment again. I think the pink thing has really gotten out of hand. When I was a kid, Lego came in brilliant reds, blues, yellows, greens and was gender neutral.
. Now it’s all fluffy and pink and aimed at girls. Boys get trains, and buildings and just generally cool sets… girls get lego shopping centres? Baby toys come in two shades… Bright and primary and interesting, or pink and soft purple.It’s stupid. But if people are going to buy it, it will continue to sell. I think the point of this gender neutral stuff is to send a message that cooking isn’t just for girls. I’m one of the people that you have helped to feed this Christmas. No words can say how happy and over joyed that we will all be together this Christmas. That’s all thanks to you. Good Bless you and your family. If that was Ikea over here it would have been walking around in a tracksuit and a pair of Nike air.